ROSS introduces a special Triple-Shaft design specifically suited for hot melts and viscous dispersions. The latest ROSS Model CDA-800 has a mixing capacity of 500 – 800 gallons and is designed for full vacuum operation (29.5" Hg). The mixer is suitable for high heat operation up to 600°F and includes an insulated 50-psig stainless steel dimpled jacket covering the side and bottom of the dished bottom mixing can. 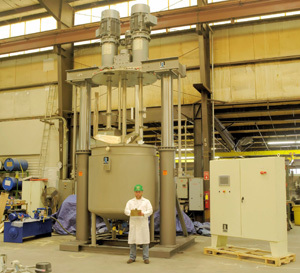 In addition to the standard three-wing anchor for bulk flow and heat transfer, the unit shown below is outfitted with two (2) reversible High Speed Disperser shafts, each featuring two (2) 16" height-adjustable blades of the classic disperser design, perfect for quick hydration of dry ingredients and agglomerate dispersion. The removable mix vessel sits 24" above the floor for convenient discharge. Speed, Time, Temperature and Vacuum Level are displayed on a 10" touch screen and controlled via PLC. These special designs reflect the company's commitment to application-specific specialty machinery.